Fikes All Purpose Cleaner: A combination of two powerful environmentally preferable technologies. Contains natural citrus solvents for usage on surfaces including: floors, walls, tile, grout, vinyl, fabrics, wood, upholstery, stainless steel and more. Available in: Ready to use quart bottles, 12 quarts per case. Non-Acid Cleanser: This safe non-acid mild cleanser is designed for both commercial and home usage. Effective against a broad spectrum of infectious diseases such as Staphylococcus, E. coli, HIV-1, and Tuberculosis. EPA registered and blood borne pathogen compliant. Available in: Ready to use quart bottles, 12 quarts per case. Fikes Enzym: Fikes Enzym digests organic waste and destroys odor associated with the decay of organic matter. It is highly effective in eliminating the organic salts associated with urine which cause odors. Special bred enzyme/bacteria cultures attack and break down uric acid molecules by digesting the source, just the way nature does it–but does it in minutes rather than days or weeks with zero environmental impact. Fikes Enzym also contains a kills-all-odors deodorant which neutralizes odors on contact. Available in Lemon or Mint fragrances. Odor control Room Fogger: This total release product will destroy all odors in any home-size room or individual office or a car that’s been in a flood, fire, engaged a skunk or any other place that is enclosed or too small for a large electric fogging machine. HCL Super Bowl Cleaner: Fikes Super Bowl Cleaner is specially formulated for porcelain restoration and initial cleanings. This 23% HCL powerful bowl and urinal cleaner is the strongest in its class. HCL is formulated with a safety inhibitor to protect all plumbing. EPA Registered. Do not use this product on any other surface than porcelain. Do not combine this cleaning product with other cleaners such as chlorine bleach. Available in: Ready to use quart bottles, 12 quarts per case. 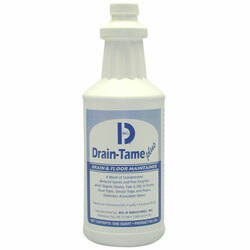 Drain-Tame Plus: Drain-Tame plus is a combination of free enzymes, nutrients and genetically engineered spores designed to quickly digest grease as well as proteins and other organic wastes. These spores continue to grow and degrade grease compounds long after initial usage. A non-acid, non-caustic formula, Drain-Tame plus is the safe and cost-effective way to treat drain systems, grease traps, septic systems and institutional floors. Coupled with a Big D Deodorant, it deodorizes while digesting organic waste and reducing the volume of solids including grease, proteins, fats and oils.